It’s not everyday we get offered a security related product to review, but with the increasing popularity of expensive items in our homes, the need to monitor your pets and and the ease of which we can communicate with devices over the web, it is of no surprise that we have been presented with the product we have in to review today, the Ycam HomeMonitor wireless camera. More and more devices are becoming web enabled, so I took the chance to take a look at the latest in home security products from Ycam. 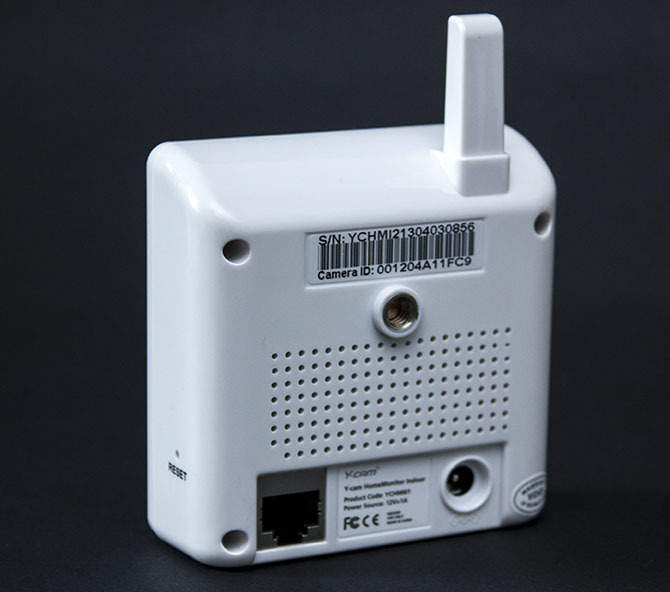 The HomeMonitor is a wireless camera that connects via wifi so you can access the camera from anywhere as long as you have an internet connection , and not only that, but there are also Android, iOS and Roku apps available for it. The HomeMonitor is part of Ycam’s cloud based product range, so if you purchase the camera, you get 7 days (history) of storage on their cloud servers included, with a paid option taking you up to 30 days. There is an outdoor and indoor version, with the main difference being the special housing for the outdoor camera to protect it from the elements – but I’ll be taking a look at the indoor version today. So that’s the basic specs of it, now lets take a look. 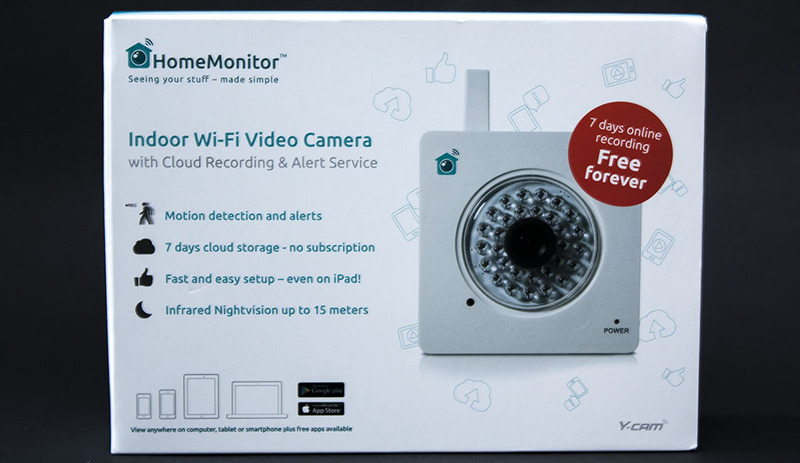 The HomeMonitor comes in a small compact white and turquoise box, with the HomeMonitor camera prominently displayed on the front alongside a bright red sticker highlighting their 7 days worth of a free storage. 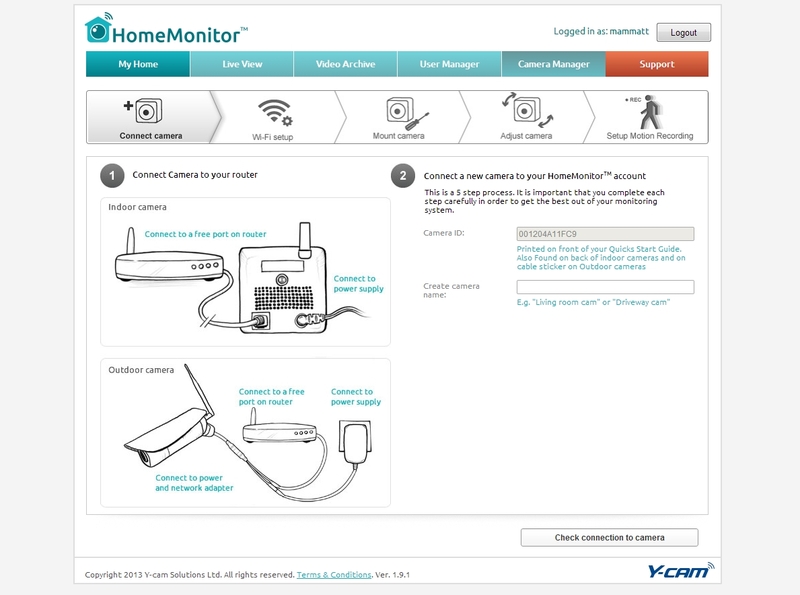 The lower left corner has features the devices that are compatible with the HomeMonitor as an app to use alongside the camera is also available. The rear of the box contains a brief description of the camera and how it works. There is short flow chart that demonstrates how easy to set the camera up is and some examples of what to use the wireless camera for. 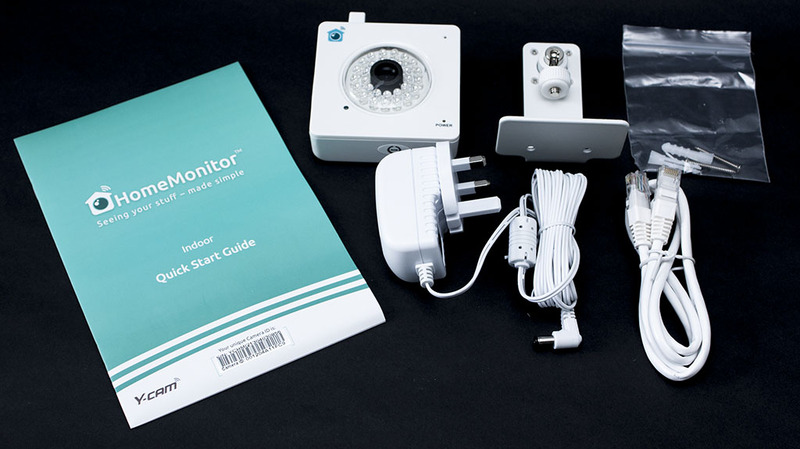 Inside the compact box, you have the HomeMonitor wireless video camera, a wall mount, power adaptor, 1m Cat5e cable, screws & rawl plugs and a quick start guide. The entirety of the contents are in white since the product is aimed for home use, thus it would be more inconspicuous (unless the walls are dark colours). Let’s now take a closer look at the camera itself. The wireless camera itself is fairly large, however this is most likely down to the many infrared LEDs, wireless antenna, ethernet connectivity and the microphone. Around the lens are 30 infrared LEDs which help capture footage during low light situations. 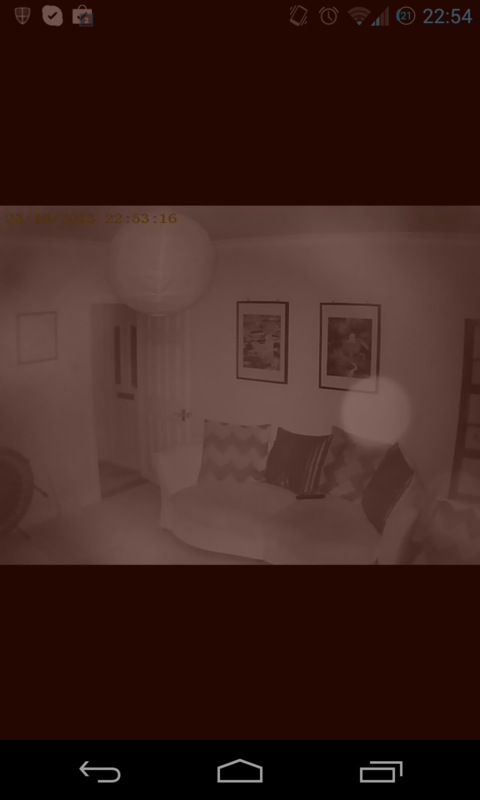 The HomeMonitor is advertised to have up to 10M in night vision, something I’ll have to test out later. On the top of the HomeMonitor is the wifi antenna and the top right, the microphone. The right face of the camera has the reset button required if you forget login/camera details. There is also an LED in the lower right corner, which flashes red when it is not connected to the network, green when it is active and flashes green when it is recording. The rear of the camera has a sticker with the camera ID number (required for setup) and serial number. Below that is the mounting point for the wall mount and further down from there is the power socket and LAN port. So that pretty much covers the camera, now on to the setup. 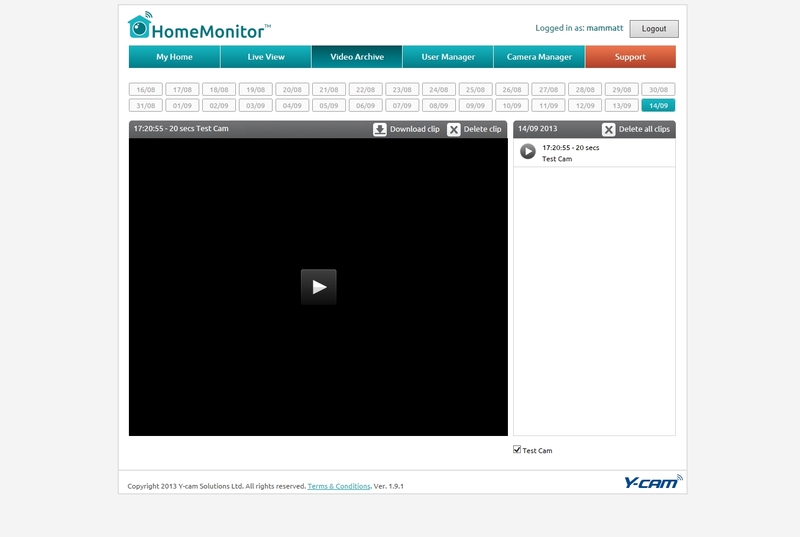 The HomeMonitor is relatively easy to setup. At first it requires a cabled connection to the router you wish to use it on, then you must go to the root directory of the camera in a browser of your choice. You are presented with a screen that asks you to login, or to create an account. Since this is our time using it, I clicked the ‘Get started’ button. Typical of most registration forms online, you have a variety of different fields that must be filled out. The camera ID must then be registered to this account, although I am unsure as to whether this permanently links the account to the camera – or perhaps it’s simply to verify that you possess a Ycam product. When the registration form is filled out, you are taken to the camera setup screen. This guides you through the initial installation of the camera and allows you to adjust various options. Since the HomeMonitor is wireless (except the power cable), you must connect it to your wifi. At first the setup wizard could not detect the network, so I had to manually add the connection to it. 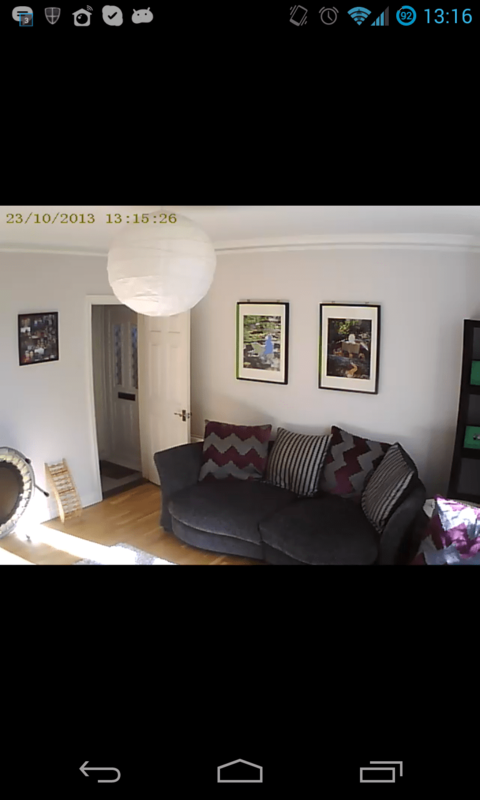 After the wifi setup, it talks you through mounting the camera and finding the optimum position for it. Following this is the motion recording setup, which allows you to define up to two areas for the camera to focus on, and start recording if movement in these zones triggers it. This page also allows you to determine which times you want to record, since not everyone will want to constantly monitor something indefinitely. The setup page allows you to simply choose which hours you would like to turn recording on, or turn it on 24/7. Once you have completed the setup pages, you are taken to the homepage for the camera, where you can access various features. From here you can view the current camera feed, view the recordings, setup and users and manage the cameras on your account. The Camera Manager allows you to turn various functions on or off and can display any pending firmware updates. You can also setup email alerts for each time motion is detected, which I’ll take a look at on the next page. The Video Archive, as the title suggests, is where all the recorded footage is stored. This lists the last 30 days worth of recordings (if that plan is purchased, otherwise it is 7). 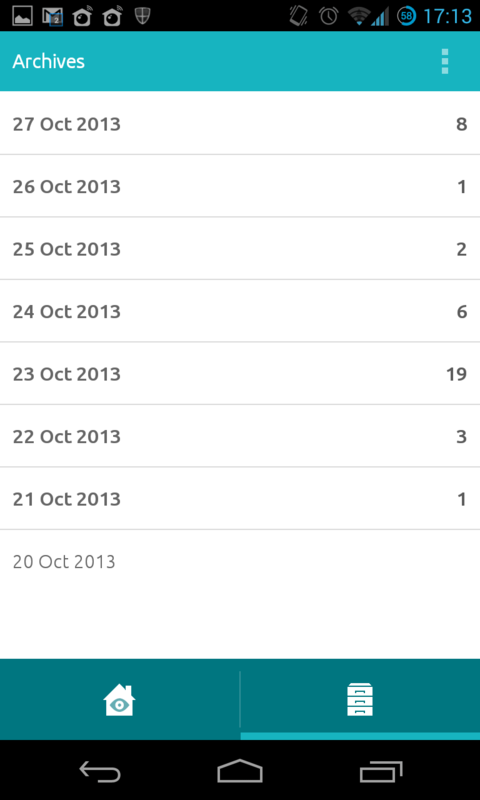 You can access the individual days and see how many recordings were made that day. You can choose to watch, download or delete the each clip. So that pretty much concludes the desktop access, so now let’s take a look at the app. Ycam have provided a free app for accessing HomeMonitors, which is available on Android and iOS via the apps stores. Just like the desktop version, you can manage pretty much all of the same features on your smartphone/tablet using a simple, intuitive interface. 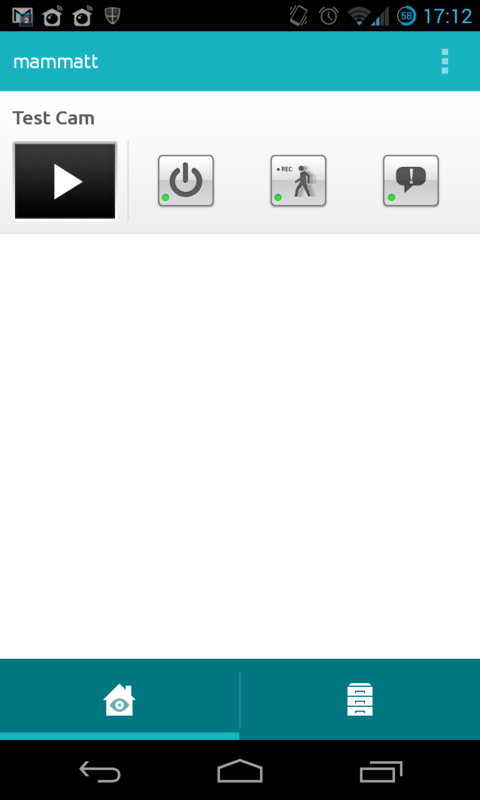 There are two tabs, one that allows you to see the various cameras on your account and turn on/off various features and the other which is the archive for all the recordings made – from which you can then play back each recording. The mobile notification is represented by a small house with a lens, with a signal proceeding from the roof. If configured, the camera can also send you an email alert. 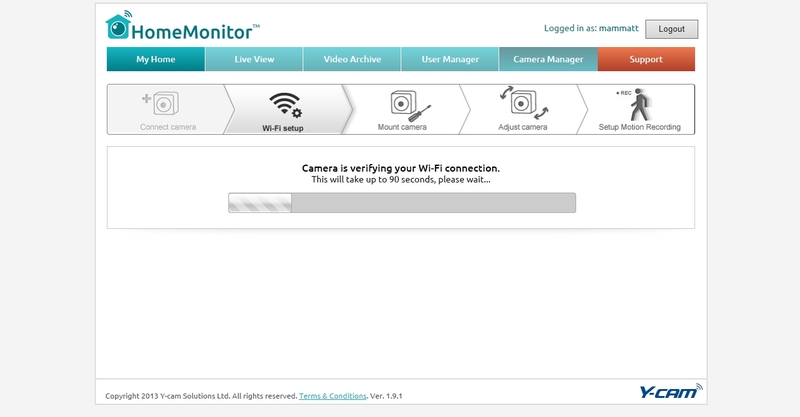 Typically these alerts are sent when motion has been detected, but by default the camera will also sent you an alert when the camera is connected or disconnected. The picture quality is fairly decent for a camera of this price/size. It’s important to be able to have a good enough picture, but low bandwidth, since this is recording straight to the internet. 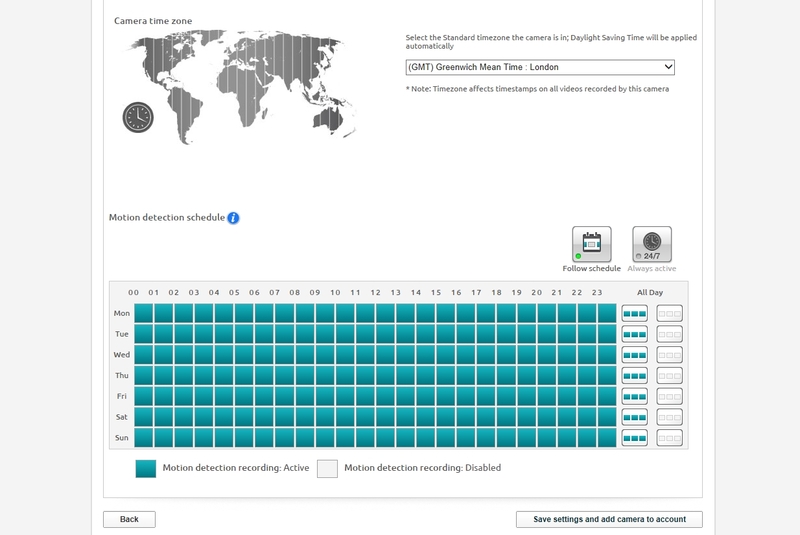 It does feature H264 compression, which does result in good recording performance. The night vision is also fairly impressive as you can see below although excuse the red tint, I forgot I had f.lux running. As you can see in the images of my lovely living room above, the image quality is not too bad considering the compression. Safety and security are forever an important aspect in our lives and with the increase in cloud based storage and smartphone useage, it was about time that a consumer level video camera was integrated with the reliable storage method and portable smart devices. The Ycam HomeMonitor is one of the first products to make use of these technologies, of which it has certainly made an impressive first impression. The device itself is fairly basic looking, although it is feature packed and incredibly user friendly. The only tricky part is getting the camera setup on the network if the WiFi connection wizard fails to detect your network – although this shouldn’t always the case for other users. 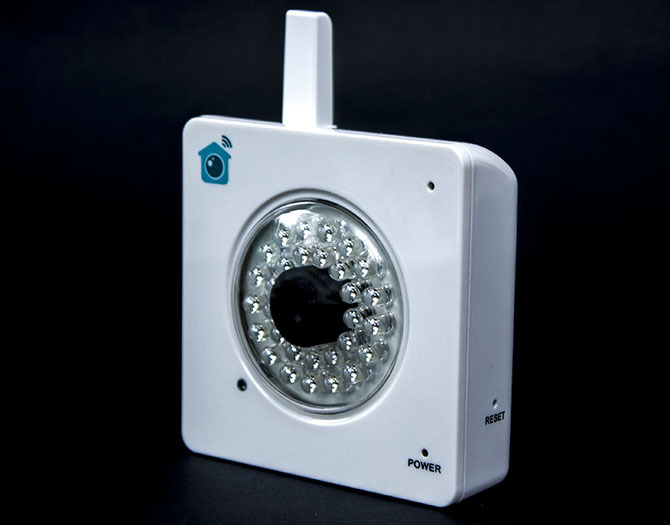 Once setup however, the device is a great addition to home security and monitoring. It has so many different applications – from pet monitoring, to watching your baby, or even just to act as a security camera for any intruders. If you wish to move it to a different location in the house, all you need to do is unplug it and then move it to the new location (as long as the 3m power cable can still reach a plug). 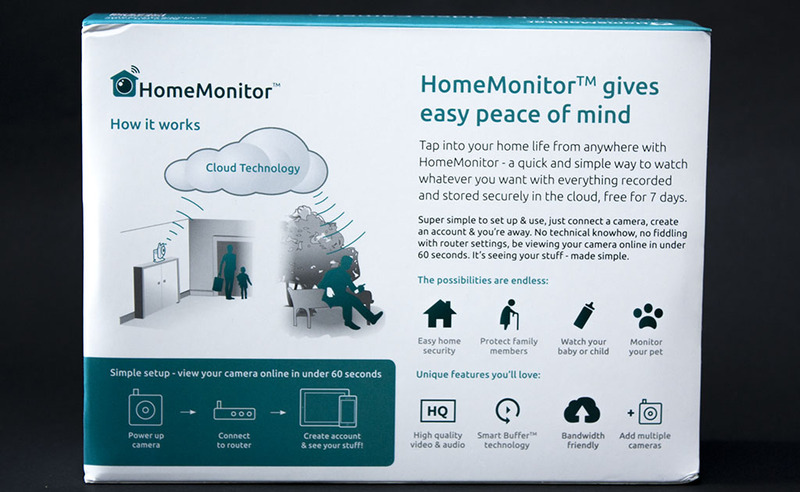 The HomeMonitor comes in at a reasonable £149.99, which is pretty impressive for a camera that has free cloud based storage, smartphone apps which allow you to monitor your home from anywhere with an internet connection and has wireless connectivity. Some users might still have doubts about cloud based storage and the security related issues, but to most it is by far the most secure means of storing the recordings and it means no one else can access them unless they use your account. The paid option for storing the latest 30 days worth of recordings is also a bonus should anyone else require a longer timeframe. I’m not entirely sure why they have included the ability to share your stored footage to the likes of Facebook and Twitter – but I guess if you manage to catch your cat doing something silly then it is a nice feature to have – although you could just download the recording at a push of a button.